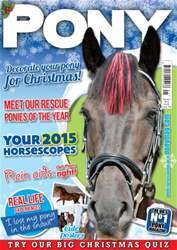 January PONY is here, and full of festive fun! Read about how to decorate your pony for Christmas, learn how to jump ditches, and take our great big Christmas quiz! Plus, read PONY readers' cringey fess-ups, check out our Christmas gift guide, and WIN great prizes!